The intense windstorm of October 26th and 27th comes on the heels of some of the mildest October weather we have ever experienced. This has extended the length of the fall color season, and opportunities to get out and see the succession of reds, yellows, oranges, and burgundy that delights our eyes and soothes the soul. One of my favorite times of the year is when the Northern Red Oaks and Northern Pin Oaks finally come into their peak of fall color in mid to late October. Most of the Sugar Maples have shed all their leaves, but the Quaking Aspen display their glorious gold at the same time as the Oaks show reds and burgundy. 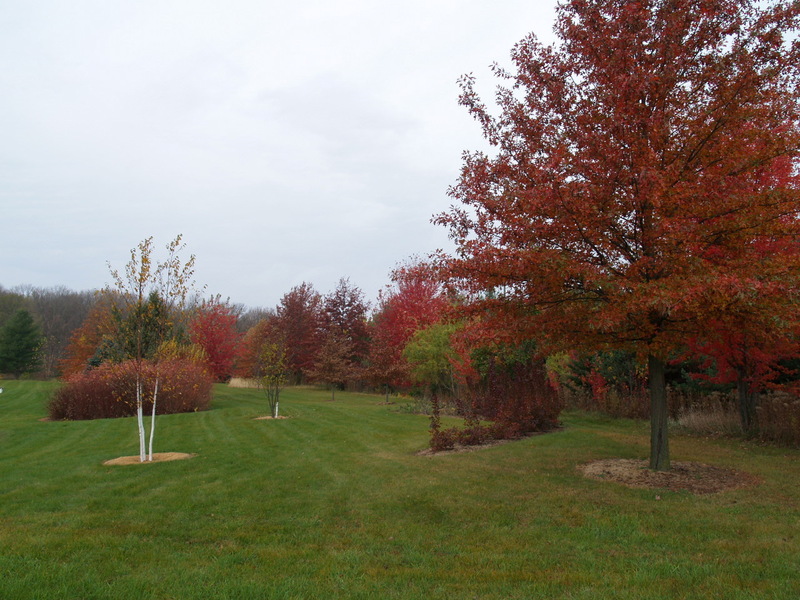 A wonderful new tree variety can also add a lovely gold to the late October landscape. 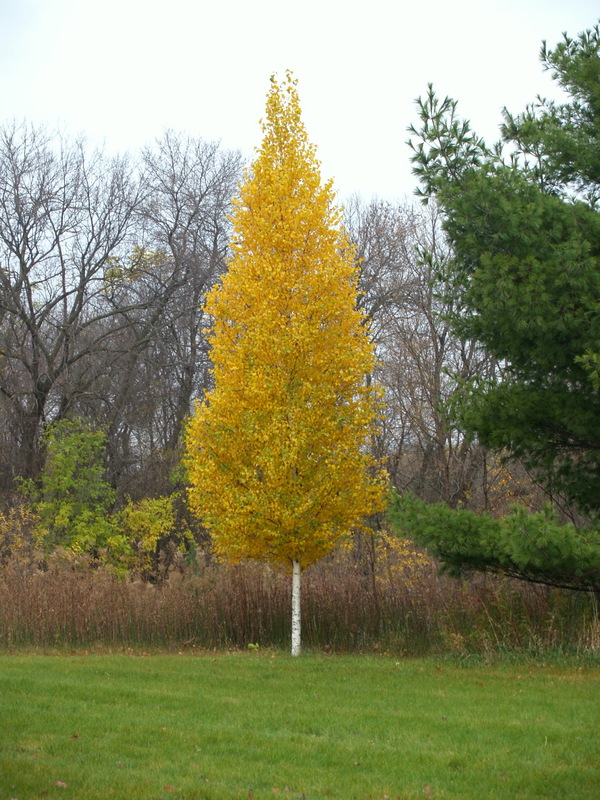 Dakota Pinnacle Birch grows quickly into a straight and very well proportioned upright shape, and turns a beautiful buttery gold at the very end of the fall color showcase, extending the autumn colors into early November. The Dakota Pinnacle in our memorial park at our home will hit peak color this year on October 27th or 28th, and blends beautifully with the Pin Oaks, Maples, Red Twig Dogwood and Flame Willow seen in the photo to the left. An added virtue of Dakota Pinnacle Birch is the beauty of the pure white bark, which only increases as the leaves fall away by mid-November. Dakota Pinnacle is also very versatile – showing an ability to gracefully tolerate alkaline soils. River Birch sometimes struggle in alkaline soils, so you may want to consider Dakota Pinnacle Birch the next time you want to add a touch of distinction to your landscape. Our fall sale will continue for the next 10-14 days and all plants are at least 30% off. Update – March, 2014: See an updated list (PDF) of all our shade trees here. And see all of our blog posts tagged with Dakota Pinnacle Birch.